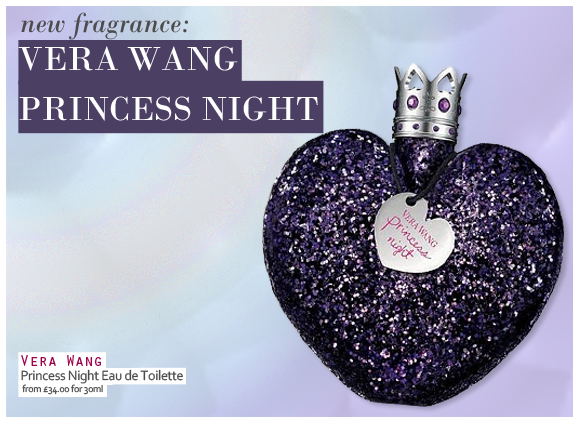 Sweet, feminine, and a little bit fruity, Vera Wang Princess Night is everything you’d expect from the popular Vera Wang Princess line. What makes it a bit special, however, is the chicness of this new scent. Where previous incarnations of Princess have been unashamedly girlish, Princess Night weaves together creamy white flora and unexpected woody notes into a sensual fragrance with a touch of mystery. The fragrance opens with a juicy blend of berries, watermelon and raspberry, a combination that is made sophisticated by the inclusion of jasmine, orange blossom and rose in the heart notes. A dry down of crushed sugar, creamy woods and vanilla lends a lasting impression of sweetness. The showstopping bottle is as beautiful in real life as it is on screen. Dipped in chunky purple glitter and topped with the signature Princess crown, Princess Night is perhaps our favourite Princess scent yet! Discover Princess Night right here at Escentual.com. Right now you’ll receive a Vera Wang Princess bag with every purchase of over £35 on Vera Wang Princess. This entry was posted on Tuesday, January 17th, 2012 at 8:00 am and is filed under Fragrance, New products. You can follow any responses to this entry through the RSS 2.0 feed. You can skip to the end and leave a response. Pinging is currently not allowed.